BLACKFIRE Tire & Wheel Cleaner is an advanced, surface-safe formula that cleans painted, chrome, polished aluminum, and anodized wheels. It cleans the most delicate wheel surfaces without staining or dulling wheel finishes. BLACKFIRE Tire &Wheel Cleaner works just as effectively on tires, releasing brake dust and dirt buildup from the rubber. It�s the only tire and wheel cleaner you need. BLACKFIRE takes advantage of recent breakthroughs in chemical engineering to create a new class of cleaner. The new, non-ionic surfactant in BLACKFIRE Tire & Wheel Cleaner quickly and safely cleans tires and all types of wheels. You can see the dirt running off the wheel! BLACKFIRE Tire & Wheel Cleaner uses a new, thicker formula that clings better to your wheel's surface for enhanced cleaning abilities! BLACKFIRE Tire & Wheel Cleaner is a 100% water-based cleaner! It contains no acids, no butyl of any kind and no petroleum distillates. It is safe for all wheel finishes including polished aluminum and clear coats. We combined this new, non-ionic surfactant with additional emulsifiers and wetting agents to allow it to quickly and safely remove all manner of dirt, road oils, and brake dust from both tires and wheels. There is no need to buy one cleaner for tires and another cleaner for wheels! BLACKFIRE Tire & Wheel Cleaner works equally well on both wheels and tires. It leaves both the tire and wheel squeaky clean. For best results, clean one wheel at a time with BLACKFIRE Tire & Wheel Cleaner. 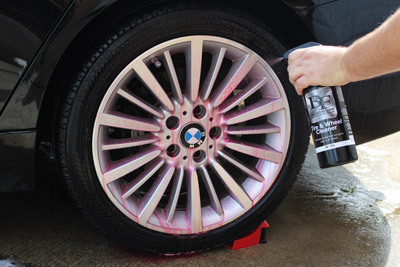 After rising loose dirt and grit off the wheel with water, spray a fine mist of cleaner over the entire tire and wheel. Allow to dwell for up to 30 seconds but do not allow to dry. Agitate with a soft brush, sponge, or microfiber pad and rinse off thoroughly. Related Items - BLACKFIRE Tire & Wheel Cleaner 128 oz.